This resume is for a professional looking a career change. The opening statement of the Medical Collections Resume draws attention to Luz’s current industry highlighting her transferable skills to a medical collections administrator position. The “Areas of Expertise” section focuses on Luz’s hard and soft skills that are relevant to her potential career goal. The “Professional Experience” section leads off with a paragraph detailing her duties and responsibilities. The following bullet points focusing on her contributions to the company showcasing her ability to work in fast-paced high-stress situations with the capability to resolve problems and closing the resume of Luz’s education. 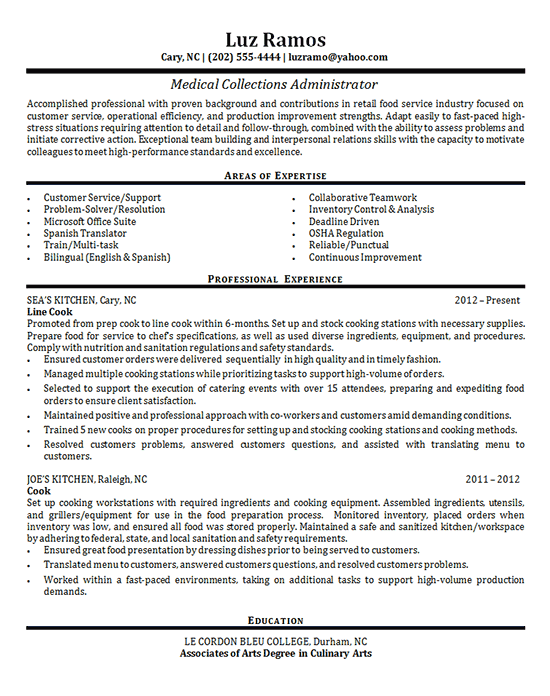 Accomplished professional with proven background and contributions in retail food service industry focused on customer service, operational efficiency, and production improvement strengths. Adapt easily to fast-paced high-stress situations requiring attention to detail and follow-through, combined with the ability to assess problems and initiate corrective action. Exceptional team building and interpersonal relations skills with the capacity to motivate colleagues to meet high-performance standards and excellence. Manage overdue accounts and review accounts receivable spreadsheets. Make consistent collection calls and issue correspondence to past due customers to obtain payment commitment. Monitor file of accounts focusing on overall delinquency recovery and maximizing efficiency. Research and resolve health care claims while assisting with rebilling of claims. Bill claims, transfers, adjustments, and write-offs. Handle insurance complaints with timely follow through. Work with fraud team and litigation manager to recommend accounts ready for legal review. Communicate with insurers to monitor medical claim status. Submit appeals to the insurance companies and work with third party payers to set up debt repayment plans.